Evangelos Venizelos is a Greek politician, currently Deputy Prime Minister and Minister for Finance of Greece since 17 June 2011. He is a member of the Greek Parliament for the Panhellenic Socialist Movement for the first electoral district of Thessaloniki. He is a Professor of Constitutional Law at the Law School of the Aristotle University of Thessaloniki. Evangelos Venizelos was born at Thessaloniki in 1957. In 1974, right after the restoration of Democracy in Greece, he was admitted to the Law School of the Aristoteleian University of Thessaloniki. Politically aware from his early years, he decided to participate actively in the strong student movement of the times as a member of the Association of Law Students and the Central Councils of the local and national Student Unions. Four years later, in 1978, he graduated from Law School and started his post-graduate studies at the University of Paris II - Sorbonne. In 1980 he was awarded a Ph.D. degree and returned to Greece. In 1984 he started his academic career as an Assistant Professor and consequently as a Professor of Constitutional Law at the Aristoteleian University of Thessaloniki. At the same time he was serving as an Attorney of Law for the Council of State and the Supreme Court. In 1987 he was appointed member of the Board of the National Center of Public Administration and one year later he was elected member of the Board of Directors of the National Bank of Greece. At the same period, he had been serving as a member of the Local Radio Committee, introducing broadcasting permits granted for the first private-owned radio stations in Greece. His political career was inaugurated in 1990 with his election in the Central Committee of the Panhellenic Socialist Movement (PASOK). In the 1993 parliamentary elections, he was elected a member of the National Assembly, representing the first constituency of the city of Thessaloniki. On October 13, 1993, he was appointed deputy Minister to the Prime Minister's Office, responsible for press affairs and consequently spokesman for the government. On July 8, 1994, he was appointed Minister for Press and Media Affairs, keeping his spokesperson duties. During his time in office, he forwarded the Bill on Mass Media, which was passed before the Parliament and turned to an institutional Law (published in the Government Gazette on August 3, 1995). In September 1995 he was appointed Minister of Transportation and Communications, a post where he served in until January 1996, when he took office as Minister of Justice. In the 1996 parliamentary elections he was re-elected MP (first in votes in the first constituency of Thessaloniki) and on September 25, 1996, he was appointed Minister of Culture. From February 19, 1999 until April 13, 2000 he served as Minister of Development. He was again elected as MP in the 2000 parliamentary elections and on November 20, 2000 he took office again as Minister of Culture. Evangelos Venizelos has published a great number of books and scientific essays and has also written many articles in the press. He is married to Vasiliki Bakatselou since 1980 and has one daughter. 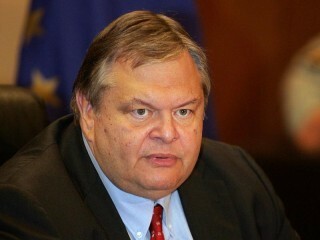 View the full website biography of Evangelos Venizelos.